After seven decades, the longest-running car in automotive history is about to disappear. Volkswagen will end production of its iconic Beetle by the end of the 2019 model-year, the German automaker announced Thursday. Conceived in Germany during the run-up to World War II, the Beetle became an icon of the American counterculture during the Vietnam War. But it lost momentum following the twin oil shocks of the 1970s and, despite two attempts to rebuild its appeal with complete makeovers, it has been little more than a largely forgotten niche vehicle in recent years. So, VW has launched what it calls the “Final Edition,” special versions of the Beetle coupe and convertible models that will mark the end of the run sometime next year. “The loss of the Beetle after three generations ... will evoke a host of emotions from the Beetle’s many devoted fans,” said Hinrich J. Woebcken, President and Chief Executive Officer of Volkswagen America. Indeed, Volkswagen announced last year that it will revive another once-legendary model, the Microbus, a hippie-era staple. It will make its return early in the coming decade as the battery-electric ID Buzz. VW plans to introduce dozens of electric vehicles as it shifts away from the diesel engines that created scandal for the brand and cost VW upwards of $30 billion. Some are speculating that the Beetle might also see a rebirth with a battery pack under its hood. It wouldn’t be the first time the ungainly coupe rose from the dead. Known as the Bug or, in other parts of the world, the Käfer — German for “beetle” — it was originally intended as part of Adolf Hitler’s plan for a “people’s car,” in German a “Volkswagen.” The Nazis turned to Ferdinand Porsche, the brilliant engineer who later lent his name to the sports car company. The first Beetle was assembled in 1938 but production was disrupted as German manufacturing was shifted to a war footing. And the Beetle might have vanished entirely if it weren’t for a British officer assigned to oversee the restoration of VW’s factory in the heavily bombed town of Wolfsburg after the end of the war. He spotted one of the little coupes under a pile of rubble and decided to start building the car again. As the German economy recovered, the Beetle was one of its first cars to be shipped to the U.S., quickly developing a loyal following among those who disdained the massive boulevard cruisers Detroit was producing. Demand exploded in the 1960s as VW’s Beetle and Microbus became symbols of the anti-war counterculture, with sales of the little coupe climbing to 400,000 annually at one point, making Volkswagen the leading automotive importer. But the 1970s brought two Mideast oil shocks, and demand shifted to Asian imports, which offered both better quality and higher fuel economy. VW itself shifted focus to newer models, including the Rabbit — known in the rest of the world as the Golf. 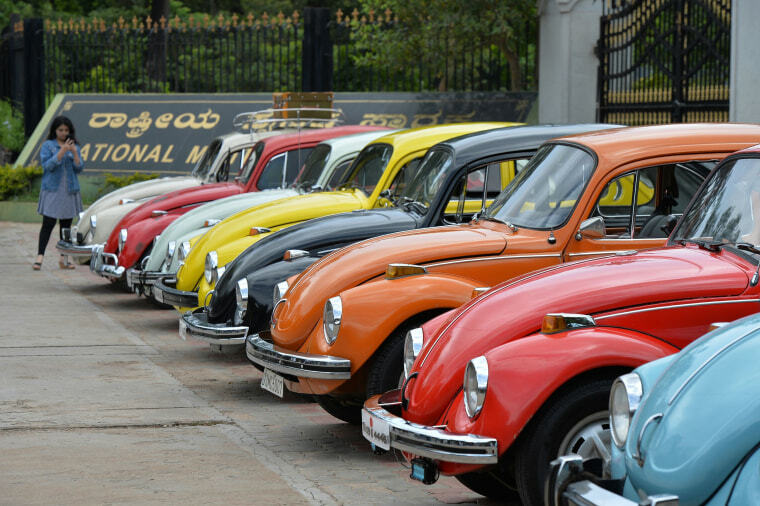 By the end of the millennium, the Beetle had largely been dropped from key markets in the U.S. and Europe and only a handful were being produced at VW’s plant in Puebla, Mexico, for Latin American markets. The original Beetle will go down in history as having the largest production run off a single platform, a total of nearly 22 million. Production was halted in 2003, down to 30,000 a year from a one-time peak of 1.3 million. The “New Beetle” debuted even before the last of the old models rolled off the line in Puebla. That new version never really connected with buyers, however — but Volkswagen decided to try one more time, launching a third all-new version in 2011. Known to fans as the A5, it attempted to recreate the look of the original Beetle, with a longer hood than the New Beetle, which VW hoped buyers would see as more macho. The automaker also lined up some celebrity endorsements. In November 2010 Oprah Winfrey announced on her TV show she would give one of the A5s to everyone in the audience. But sales never took off, despite VW introducing a series of special editions. Last March, officials announced there would be no fourth-generation Beetle, hinting that the current model would be gone before the end of the decade. They still haven’t said precisely when the final car from the Final Edition will be built, but it is expected to be gone by the end of the current model-year, some time in mid-2019. As for the Final Edition, it will be available as a coupe or a convertible. Two unique colors, Safari Uni and Stonewashed Blue, will be added to the standard paint options.There will be some distinctive body details, including chrome trim and body-color side mirrors. Pricing will start at $23,940 and run into the mid-$30,000 range. When the final Beetle does run down the line it will have the distinction of being the longest-running nameplate in automotive history.